Rosacea is a condition that affects the skin but occasionally it can spread to the tissues of the eye, causing a mild infection. Unfortunately, in some people, rosacea of the eye can become more aggressive, and it is important that it is recognised and treated to prevent loss of sight. What causes rosacea of the eye? The condition can only develop in someone who already has rosacea, and about half develop some form of eye problem. This skin condition is fairly common and tends to affect adults in the 30s, 40s and 50s, particularly women. It is thought to start with a bacterial infection in the skin, but then the main symptoms and signs are caused by the body’s response. This takes the form of an intense over-reaction, which causes generalised inflammation in the skin and eye tissues. People with a particular genetic background may be more prone to getting rosacea and it is thought that infection with the bacterium Helicobacter pylori and a skin mite may also increase the risk of developing the underlying skin condition. Problems with blood vessels may also be a factor, as the inflammatory response that is set off has a greater effect on the blood capillaries in the skin in some people. The first symptom that someone with rosacea usually notices is flushing of the facial skin. This can happen for many different reasons, and it is usually ignored at first. Rosacea can develop in menopausal women, who are prone to hot flushes, and the symptoms are often explained away. As the infection and the inflammatory response become more severe, the skin looks red most of the time, and obvious broken blood vessels and thread veins become more noticeable in the skin. It is common for the skin to feel irritated and itchy. Patches of skin can start to thicken, looking a little bit like acne, but the skin lesions are flatter and smoother, and do not usually erupt into actual spots. The thickening of the skin becomes more widespread causing changes in the appearance of the face, which can be very distressing. Rosacea of the eye starts with the feeling that you may have some grit in your eye, or you are developing a mild conjunctivitis. The eyes feel sore and itchy and they can either water profusely or become quite dry. The inflammation of eye tissues distorts vision, and people affected often complain of blurred sight. 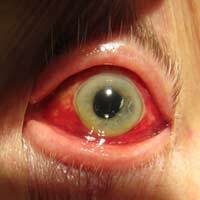 The small capillaries in the sclera, the white of the eye, become more obvious, giving the eyes a bloodshot appearance. In its most severe form, rosacea of the eye leads to corneal ulceration, ulcers in the clear membrane that covers the front of the eye. This can lead to severe vision impairment, or even complete blindness in the affected eye. Some environmental factors are known to make rosacea worse, and avoiding them as far as possible may reduce the symptoms in the skin and in the eye. Red wine, caffeine and spicy food are commonly associated with facial flushing and avoiding these can help. Not having hot baths or showers, hot drinks, keeping out of the sun and avoiding hard and sustained exercise and emotional upsets are also recommended until the condition is brought under control. For eye rosacea in particular, bathing the eyes and using alternate clean cloths dipped in hot and then cold water can help the eyes feel less sore. Once rosacea of the skin has been diagnosed, the normal treatment is to try to eliminate the bacterial infection that has led to the inflammatory over-reaction. For people with rosacea of the eye as well as the skin, tetracycline tables are usually prescribed. These deal with the underlying infection fairly effectively but they also help reduce inflammation, particularly in the eye, and may also help normalise eye secretions from the tiny glands in the eyelids. Erythromycin cream can also be applied directly onto the eyelids to reduce the infection in the skin nearest to the eyes. If you test positive for Helicobacter pylori, it is a good idea to treat you for this to reduce your risk of developing a gastric ulcer, as well as to improve your rosacea. This involves taking a combination of three antibiotics over a period of several weeks. When the symptoms of eye rosacea become particularly troublesome, artificial tears can help, and your GP may decide to prescribe steroid eye drops if there appears to be a danger that the cornea is becoming scarred by the inflammation. In the very rare cases in which the cornea is badly damaged, surgical treatment to replace the cornea may be required.